For the first time since 2009, Korea's main carriers – Asiana and Korean Air – are both in the red for the first half of the year. 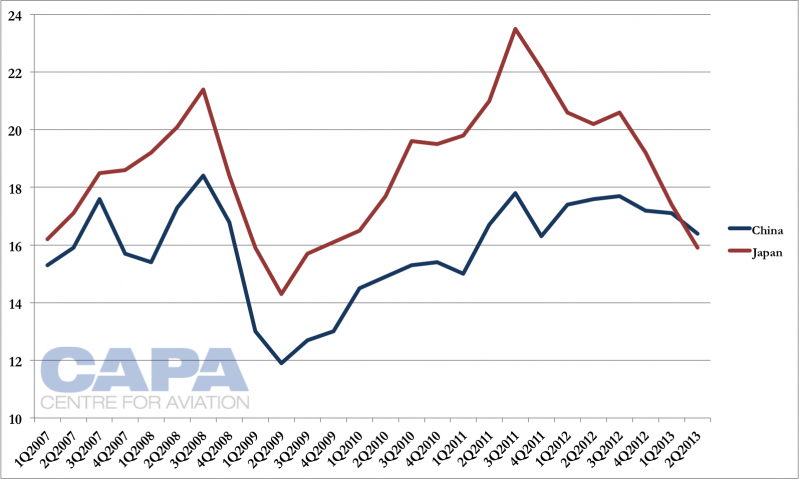 While Korean Air's non-consolidated operating profit has improved from 1Q2013, Asiana's has deteriorated. 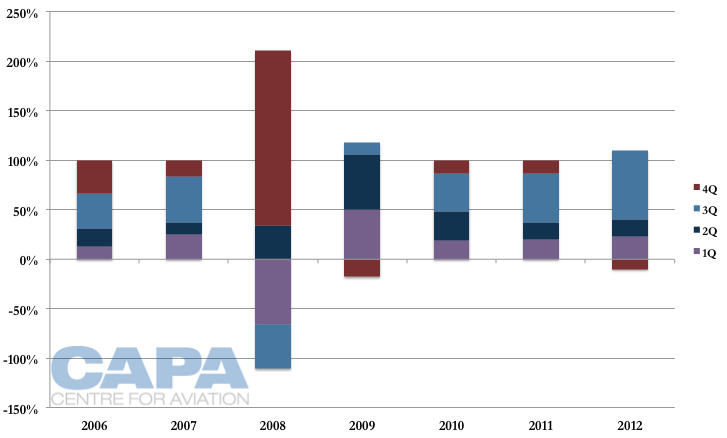 As of 2Q2013 Korean Air is at a -1.5% operating margin while Asiana is at -3.2%. The difference is largely due to failure to practice capacity discipline: Asiana grew international ASKs by 7.2% while Korean Air grew its international ASKs only 0.9%. Two of Asiana's markets saw 16% growth, including China, whose current demand weakness is well known. Another weak market is Europe, where Korean Air cut capacity by 6% while Asiana grew by 6%. Such brash moves from Asiana are perhaps only justified by taking a long-term view that capacity must be put in now to secure a position in the future, but this is a bet. The third quarter is typically the strongest for the carriers, when they can derive upwards of 50% of their annual profits. But unchanged is underlying regional weakness that has seen yields plummet. Capacity discipline is also wanting: Asiana so far is due to grow 5.7% in 3Q2013. Meanwhile a curious hybridisation movement is hatching at Asiana, which will re-configure eight A320s to an all-economy regional layout. For 2Q2013 Asiana reported a non-consolidated KRW41.5 billion (USD37.0 million) loss compared to a profit of KRW27.0 billion (USD24.1 million) in 2Q2012. Korean Air meanwhile had a 2Q2013 KRW43 billion (USD38.6 million) loss, but its far greater revenues mean its operating margin was -1.5% to Asiana's -3.2%. The quarter was the third consecutive one of operating losses. This is also the first time since 2009 both carriers had first half operating losses. Asiana's revenues fell 4.5% while costs increased by only 0.8% despite a 4.5% increase in system RPKs and 6.9% in ASKs – solid performance on the cost side. The largest improvement was fuel costs. At Korean Air, its revenues fell a more drastic 9.5% but costs fell 5.1%, also good performance considering ASKs increased 0.2% and RPKs shrunk 2%. 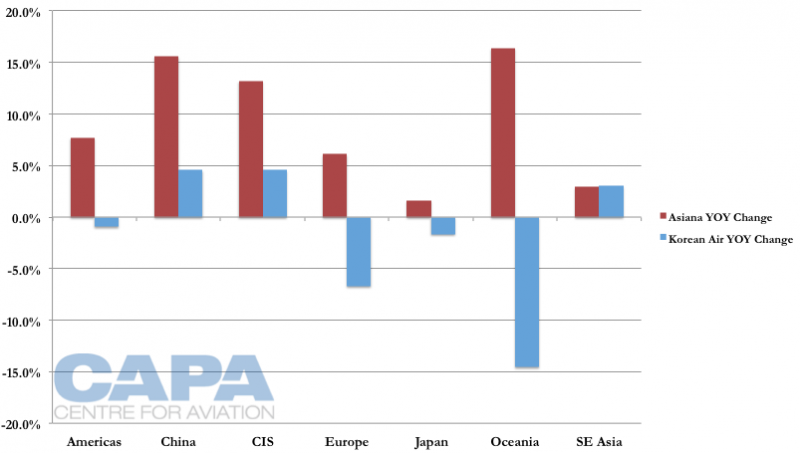 Net income meanwhile is sinking on foreign exchange losses, and this has been the focus of media attention, but overlooked is that the underlying airline business is also weak. Of no help of course is cargo, which comprises about a quarter of revenue at each Asiana and Korean Air. Asiana reports, in line with other carriers, decreasing cargo yields and load factors. The Korean outbound cargo market is being particularly hurt with a reduction in car parts (down 21% to 4.9 million tons) and display screens (down 75% to 2.5 million tons). Asiana and Korean Air's key markets are China and Japan. The two regions comprise 20% of capacity but 32% of revenue at Asiana, which discloses segment information. Year-on-year comparisons show declines in four of the past five quarters in China (the exception was 2Q2012, which saw flat performance – 0.2% growth) and declines for five consecutive quarters in Japan. Absolute yield amounts, and not year-on-year comparisons, show Japanese yields have been declining for all but one of the past eight quarters. Chinese yields have fallen for only three quarters, but are still doing well compared to historical performance. Yields are still plush for Asiana at USD16.4 cents in China and USD15.9 cents in Japan, at levels that would make most carriers envious. But Asiana and Korean Air are dependent on strong performance in those markets to compensate for lower yields elsewhere and overall low load factors. Korean Air does not release yield information, but is expected to be tracking ahead of Asiana, although not greatly so. Various factors have impacted the markets, adding credence to the saying the airline industry is always in crisis. Current drivers include 32% fewer Japanese travelling to Korea because of a territorial conflict and concerns about North Korea, adding to the appreciation of the Korean won and depreciation of the Japanese yen. The outbound Korean market to Japan has grown 40%, but this is a smaller portion of the total market. The outbound market from Korea to China decreased by 9% due to concerns over bird flu, the effects of which have hit other Chinese carriers. 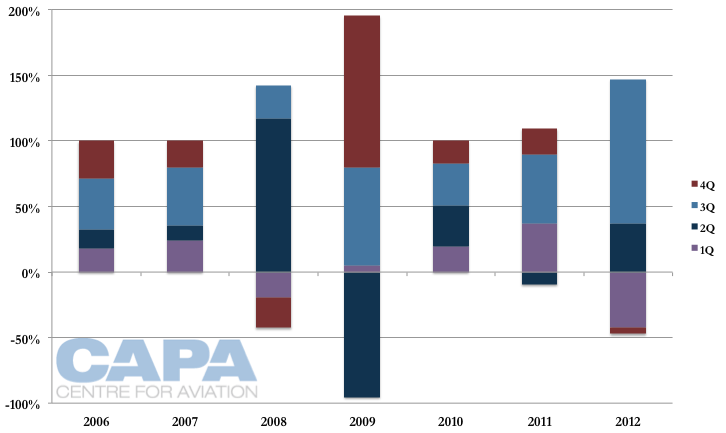 Asiana and Korean Air took different approaches to capacity growth in 2Q2013. 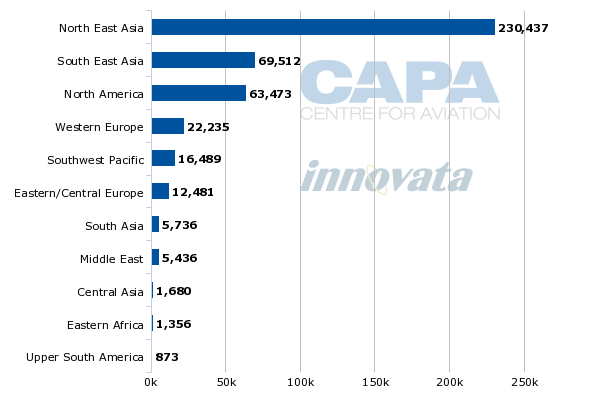 Korean Air's overall international capacity was up 0.9% while Asiana's was up a staggering 7.2%, measured in ASKs. Korean Air had either capacity cuts or lower growth than Asiana in all of their common markets except Southeast Asia, where Korean Air grew marginally faster than Asiana. One would have hoped for capacity discipline by Asiana after it squeaked by in 2Q2012 with only a 2.0% operating margin and breakdown in operating environment: a weakened China and Japan. Wishes for capacity discipline are further strengthened by Asiana's first quarter loss, its first since 2009. While Korean Air reduced 2Q2013 losses by about 70% compared to 1Q2013, Asiana grew losses by 29%. Asiana's Japanese load factor is 68% while China is at 69%; this is weak performance with much room for improvement. Korean Air does not disclose traffic by region. Asiana's system load factor in 2Q2013 was 76.8%. Asiana's large growth in weak markets – China and Europe – is concerning. There could, however, be a long-term strategic rationale. Asiana has been smaller than Korean Air since its inception as Korea's second carrier. 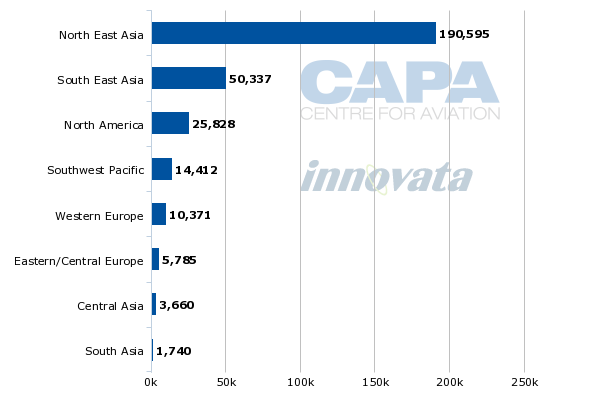 Asiana has fewer seats than Korean Air in every region but the tiny Central Asia, and Asiana is absent from Africa and Latin America whereas Korean Air is not. While the gap between the two is unlikely to be closed in the medium term, Asiana is looking to catch up with Korean Air. Asiana like Korean Air has large amounts of transfer traffic, so sensible expansion in North America requires enlarging the local Asian feed for those services, as well as benefit local markets. Securing increasingly rare slots and airspace rights in China is also an important driver for the long term. Asiana says it will reconfigure eight A320s from 143 seats (eight in business and 135 in economy) to an all economy configuration of 156. No additional details are available, but Asiana's current A320 fleet is in various configurations of mixed class 143 and 146 (mainly for short-haul international routes to China and Japan) as well as all-economy 162 (domestic). So it appears that Asiana is moving to have an all-economy offering for regional Asian routes, logical given demand in these thinner markets is leisure based. Korean carriers, including LCCs, in recent years have grown significantly in regional Chinese cities via scheduled capacity and charter services. This traffic is almost entirely leisure. Yet the plan raises questions. The difference between the new 156-seat configuration and the existing 162 configuration is just a single row, and a streamlined configuration grants flexibility (and moving to more economy seats, more revenues and lower unit costs). This hybridisation also overlaps with Air Busan, the LCC in which Asiana has 46% ownership. Air Busan has fallen behind Korea's LCC pack. Asiana has kept Air Busan languishing, providing it only with classic 737s and older A320 family aircraft as well as limiting it to some unprofitable routes, rather than supporting a more ambitious strategy to unlock regional growth. A need for all-economy short-haul services surely had Air Busan's name on it. LCCs like those in the Jetstar Group have demonstrated that full-service passengers can be accommodated, connecting onto a LCC without their feeling they are on an LCC. Luggage, meals and even amenity kits on long flights are supplied. Various Jetstar affiliates take connecting passengers from airlines including Air France-KLM, JAL, Jet Airways and Lufthansa – these are significant names. But replicating this approach would have required integration and a strong LCC strategy that neither Asiana nor Korean Air, with its Jin Air LCC subsidiary, are ready to embark on yet. 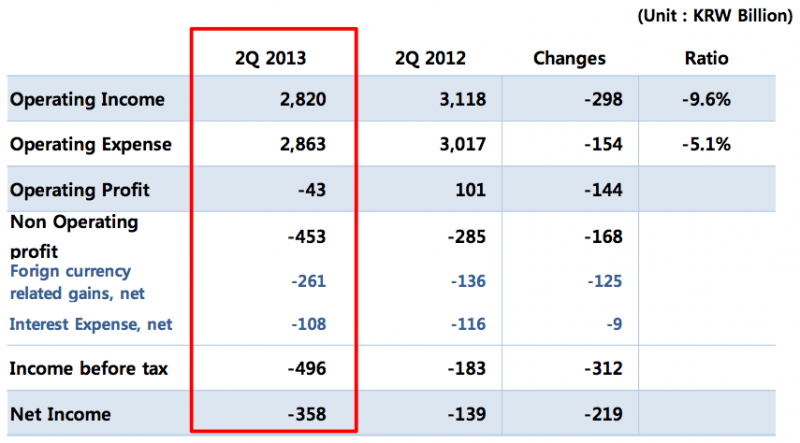 While 2013 is off to a bad start with losses in 1Q2013 and 2Q2013, 3Q2013 is key to an annual profit. Upwards of half of the year's total profit can be derived in just the third quarter (01-Jul-2013 to 30-Sep-2013), which covers the peak northern summer season. Asiana's strong 1H2013 losses will almost ensure the carrier cannot avoid a full-year operating loss, while the net loss will be even greater as it must take into account losses from its Jul-2013 accident at San Francisco. But capacity is not moving in the right direction. 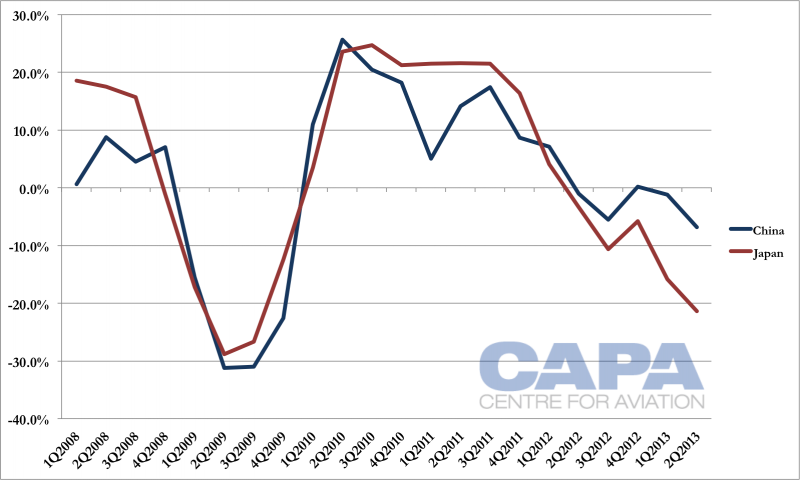 Korean Air has about flat capacity (ASKs) in 3Q2013 compared to 3Q2012, according to OAG data. Asiana is up 5.7%, and this is already with weak load factors. While the summer brings demand and late Sep-2013 the슬라이드 1Chuseok Holidays, this is angled towards leisure passengers. There will be typical network adjustments: Korean Air is looking to increase frequency to Bangkok, Changsha, Ho Chi Minh and Tianjin. Asiana will downsize aircraft to Japan and cut unspecified medium-haul flights. Some short-haul flights have already been cut, including Seoul-Sendai (Japan), which after load factors as low as 40% in Apr-2013 and May-2013 will drop from daily to four weekly in Sep-2013 (a noticeably long lag time). Services from Seoul to Da Nang and Yangon will be halved from four to two weekly. But elsewhere there is growth: daily Jakarta and two-weekly Bali services have been launched, Kota Kinabalu goes from six weekly to daily and Istanbul from three weekly to five weekly. With capacity in 3Q2013 still not "disciplined" and there remain fundamental consumer reasons to avoid travelling – weak economies, territorial disputes, fear of a North Korean incident – the short term outlook is discouraging. There could be a long-term benefits from securing slots and traffic flows that can later be made profitable, but such strategic goals are rarely attractive to analysts and shareholders.